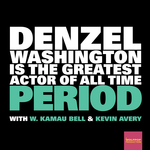 Kamau discusses how great Denzel Washington is with his friend Kevin Avery. Man on Fire may very well be the ultimate Denzel Washington movie. Kevin & Kamau talk about the wonderful Denzel/Christopher Walken team-up, Denzel becoming the greatest dad in the world, and why the movie is basically The Equalizer in Mexico. They also discuss Rachel Dolezal identifying as black and Kevin's surprise visit to the Container Store. Plus, they call up friend of the show Johnny Skourtis aka Ralphie from The Equalizer to talk about the the now green-lit sequel to The Equalizer.